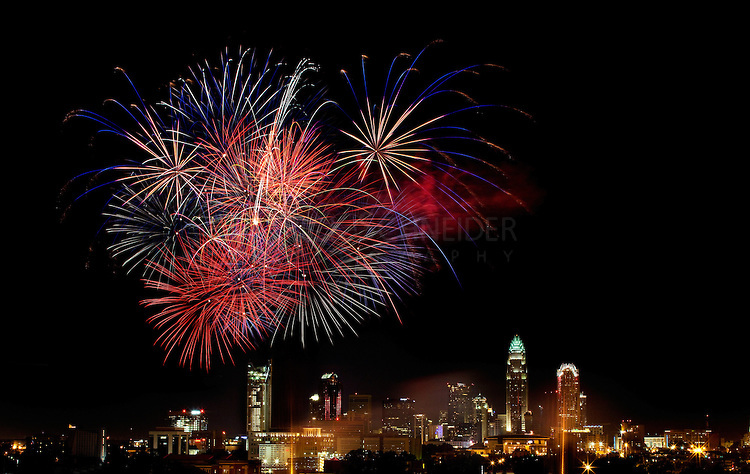 CHARLOTTE CELEBRATES JULY 4TH, 2014! | South Charlotte Newcomers! Charlotte is celebrating 4th of July with fireworks and family fun! News Talk 1110 and 107.9 The Link’s SkyShow 2014 with the Charlotte Knights returns to Uptown Charlotte at the BB&T Ballpark, 324 S. Mint Street for the best fireworks display in the Southeast! SkyShow is the Southeast’s largest fireworks display! Stadium gates open 5:00 p.m. The Skyshow Street Party runs 3-7 and will have live music, balloon artist, food and games for the entire family! The game begins at 7:05. After the watching the Charlotte Knights play ball, enjoy the fireworks display and make sure to stick around to honor our Veterans and Military Personnel at the patriotic flag ceremony. Skyshow fireworks can be seen from several locales near Uptown Charlotte. Another parking deck viewing point is Crown Plaza Parking Deck at 201 S. McDowell Street. The U.S. National Whitewater Center is offering family fun at its 4th of July Festival. Live music and fireworks will be available July 3-4, 3:30-10pm at 5000 Whitewater Center Pkwy. The Charlotte Symphony will be performing a special July 4th musical evening! Summer Pops musical theme is Celebrating America and will be 8:15 p.m. at Symphony Park, 4400 Sharon Road. Athletes can celebrate freedom at the July 4 Spectacular 4 Miler presented by Toast Café. The family festival and 4-mile race finish will take place in the Dilworth neighborhood at Toast Café, 2400 Park Road in Charlotte. The run begins at 7:30a.m. Get a jump on July 4 by participating in The Charlotte Firecracker 5k and Fun Run on July 3, 2014. The run loops around the Olde Providence neighborhood in South Charlotte. The 5k will finish at the Windyrush Country Club where family can enjoy swimming, music, food and drinks. The entire family will have an action packed day on July 4 at Carowinds! On July 4-5 free park admission for ally active, inactive or retired United States Service men and women will be given with a valid military I.D. Carowinds Thrill Zone will be the place to be for the fireworks extravaganza Nights of Fire in the skies above Carowinds! Southern hospitality blasts in with patriotic family fun throughout the Charlotte area! Gather your family and friends and celebrate freedom in the Queen City!